Democrats, and I include Hillary Clinton, took a beating in the United Sates, no longer controlling the majority of state governors, both the House and Senate in Congress, including our House and Senate here in Minnesota. Because of these defeats, Democrats want to use Black people by pushing this fear of Trump, fear of and Republican doctrine. The sad reality is that many of us Blacks allow ourselves to be used by Democrats by pushing this fear of Republican when it comes to issues such as welfare, voter identification, and other issues not in agreement with the Democrats’ ideology. We have to stop allowing Democrats to use Black people, as they are now, against Trump and other Republicans by pushing this fear, this helplessness into our culture. We are being used to protest, we are being used to cry. We are being used to tell our young children, our families, of the difficult times ahead because of Trump’s presidency. We are being taught to teach our young Black people this organized fear of White Republicans, leading into this internalized pseudo adaptation to inferiority of White Republicans, while simultaneously teaching that the only savior is the White and powerful Democrat. I am a Black man who is too gifted, too talented and aware of the factual and proven strength of Black people surviving through some of our darkest moments in history. No man — no Trump, no Republican — will stop this Black man. And this Black man has refused to accept the Democrats’ polices that make our people dependent, so that we are too bound by these dependency shackles of slavery that we run back to the Democrats and be the Democrats’ puppet by acting out the fear, living in fear over the next four years Trump is in office. For this message of doom to be promulgated in our neighborhood because Democrats got their butts kicked is evil. Medgar Evers, Dr. King and Malcolm X with others, did not die for us to feed into this “hold your head down and feel the fear of the plantation” mentality because of Trump. I will not dishonor the name of the many Blacks that have fought for my right to be here today by showing that kind of fear. Both you and I must show our talent, strength and gifts as Black people to learn and use Trump and Republican policies, such as School Choice and Educations Act to send our children to public, private, charter, and magnet, religious or home school of choice. We must be involved and use the Middle Class Tax Relief Act to create jobs due to tax reductions. We must learn and use the Affordable Childcare Act, and Trumps ideas for the Restoring Community Safety Act to reduce crime and increase jobs. We cannot oppose Republican policy that is good for Black people based on the fears of Democrats and the direction of Democrats to “Just say no,” or to please those that make their living telling us to live in fear and helplessness. You have only two choices: live in doom over the next four years, or to act as strong, gifted, talented Black people by using Republican policies that benefit our people. How will you do that if you live in the fear of Democrats and do not explore those policies? Read my column and listen to my radio show online Sundays 3-5 pm at WFNU.org, because my message is not about Black doom but Black power. We are doing much more than living in doom for the next four years. 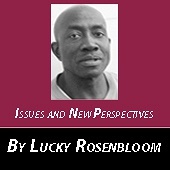 Lucky Rosenbloom welcomes reader’s responses to 612-661-0923, or email him at l.rosenbloom@yahoo.com. Amen. We need more of this out in the open. I have been saying this (not very loud) for a while. I heard you tonight on Newstalk and you have just earned a lot of respect from me, for what that’s worth. I hope to meet you some day and shake your hand. A man in the know…Awesome!! !